This isn’t the first time the world of professional sports has entered the fight for civil rights and racial justice. 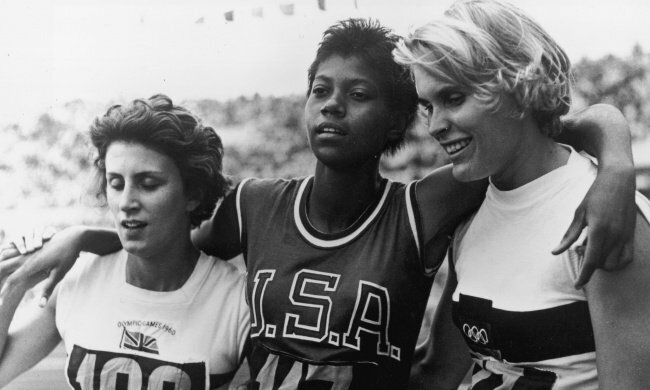 The three winners of the Ladies 200-meter final at the Rome Olympics on September 6, 1960: from left to right, Britain’s Dorothy Hyman (bronze), the USA’s Wilma Rudolph (gold) and Germany’s Jutta Heine (silver). Credit: YES! Magazine/Central Press/Hulton Archive/Getty Images. All rights reserved. When NFL players, coaches, and owners took a knee during the national anthem Sept. 24, it ignited a nationwide discussion about the role of athletes in standing up for racial justice. Since then, teams and players have continued taking a knee during the national anthem. And the Seattle Seahawks have taken the symbolic act one step further by launching the Seahawks Players Equality & Justice for All Action Fund. But this is hardly the first time the sports and political arenas have become intertwined. “Sports has always been an important platform in which America’s ugly racial history has been challenged and where African-Americans have fought for full recognition and respect,” said Dr. Mark Naison, a History and African American Studies professor at Fordham University. Most people remember Jackie Robinson shattering major league baseball’s color barrier and John Carlos and Tommie Smith delivering a Black power salute at the 1968 Olympics. These are often heralded as moments in sports when athletes added a prominent voice to the fight for civil rights and racial justice. But there are many lesser-known examples in the history of sports when individuals and groups stood up against racism. Here are four of those moments. NBA star Mahmoud Abdul-Rauf protests the anthem in 1996. That was certainly the case with Mahmoud Abdul-Rauf, whose national anthem protests more than 20 years ago received media and professional backlash much like Kaepernick is experiencing today. Not much has changed since Abdul-Rauf’s days as a high-scoring point guard with the NBA’s Denver Nuggets. In a recent summer hoops tournament for retired stars, he showed he still possesses his patented quick release and sweet jump-shot. And at that tournament, during the national anthem, Abdul-Rauf stood, palms up, in silent prayer for the oppressed poor and people of color in America, just as he did as a NBA star in 1996. Then, Abdul-Rauf sat while the “Star Spangled Banner” played, causing the NBA to swiftly issue him a two-game suspension and stirring a national debate at that time. Abdul-Rauf said the American flag was a symbol of global “tyranny and oppression” that, therefore, didn’t represent his Islamic beliefs. Abdul-Rauf continued to face enormous backlash when in subsequent games to he chose to stand and pray to Allah during the anthem. But he did not waver. “My beliefs are more important than anything,” said Abdul-Rauf at the time. “If I have to give up basketball, I will.” Shortly after being reinstated Abdul-Rauf was traded away from the Denver Nuggets to the Sacramento Kings where he received significantly less playing time and then, unable to secure another playing contract, was effectively blackballed from the NBA. Black Newspapers: The Unsung Heroes in the Jackie Robinson Story. Today, statues of Jackie Robinson outside baseball fields in Los Angeles and Brooklyn honor the Hall of Fame career of the first African-American to play major league baseball. But Robinson didn’t do it alone. Black newspaper editors helped pave the way for Robinson and the integration of the major leagues. And in 1938, Wendell Smith dedicated his column in the Pittsburgh Courier-Journal to chiding Black consumers for upholding the “institution that places a bold ‘not welcome’ sign over its thriving portal” each time they attended major league games. According to Naison, a major part of the newspapers’ strategies to integrate baseball was to conduct interviews with White players after they played unorganized exhibition games against Black clubs, asking them to assess the talent level of Black players. Serena Williams at Indian Wells. Serena Williams recently won her 23rd Grand Slam at the Australian Open, the most wins of any tennis player ever. It’s one reason why ESPN and The New Yorker have called Williams the greatest professional athlete of all time. But before reaching this height, Williams competed in her first major tournament at Indian Wells, California, in 1999 in front of a hostile White audience. After her winning match against Steffi Graf at Indian Wells, Williams promised to boycott the tournament, and for 14 years she didn’t return. Since then, Williams has faced oppression as a Black woman in a majority White sport. But she has shrugged off lewd comments about her body shape and her curves with grace, class, and fierce determination. In 2015, Williams returned to Indian Wells, to the surprise of the tennis world, and she used the event to raise funds and media attention for the Equal Justice Initiative, which works to end racism in the criminal justice system. Olympian Wilma Rudolph faces Jim Crow America. An African American woman, Wilma Rudolph, overcame childhood diseases including polio and left leg paralysis to become widely known as “the fastest woman in the world.” At the 1960 Olympics, Rudolph won the 100- and 200-meter races and helped the U.S. win the 4 x 100-meter relay. “Because of the Cold War it became very important to show sporting strength in the '50s and '60s, and it gave women like Wilma Rudolph platforms to be seen across the country and the world,” Davis said. Rudolph returned to the United States after her successful Olympic performance as a national heroine and a celebrity. But this did not exempt her from suffering the racism in her segregated hometown of Clarksville, Tennessee. On June 13, 1963, Jet Magazine published the headline, “Hometown Eatery Jerks Welcome Mat from Wilma.” Shoney’s, a local restaurant, had refused to serve Rudolph. So Rudolph and members of the Citizens Committee on Local Affairs began a month-long demonstration against the restaurant’s segregation. When Tennessee Gov. Buford Ellington, a devout segregationist, planned Rudolph’s welcome home parade, she refused to attend the segregated event. Later, her hometown threw a parade and banquet in her honor. It was the first integrated event to be held in the town. This article was funded in part by the Surdna Foundation and first published in YES! Magazine.